Hi, I'd like to show you this page I found on Miskelly Furniture's website. Gold leaf finish with heavy antiquing on iron frame with iron cross stretchers. Top is reinforced mirror and gallery shelf is clear tempered glass. 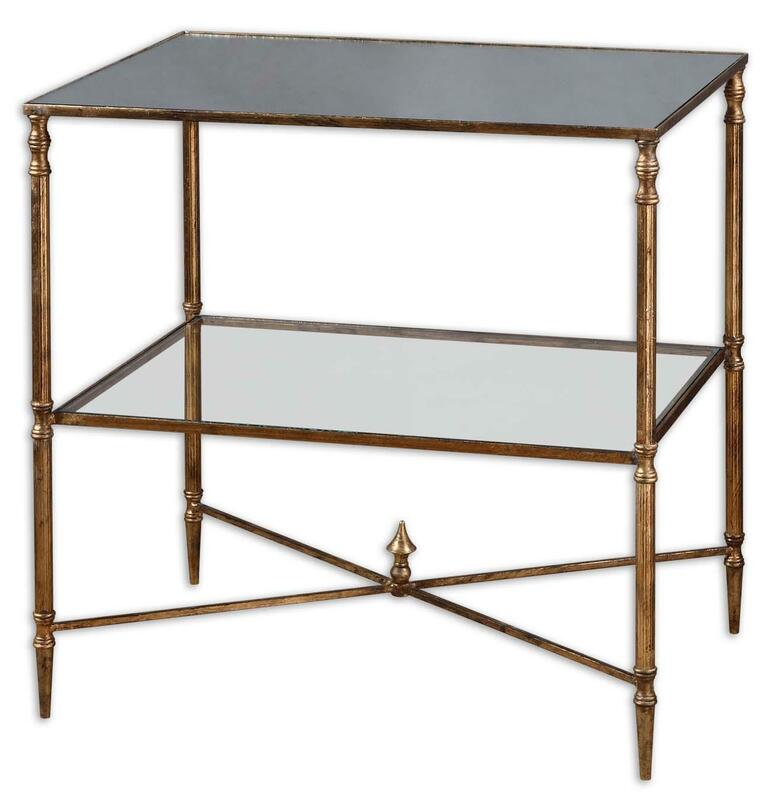 The Accent Furniture - Occasional Tables Henzler Lamp Table by Uttermost at Miskelly Furniture in the Jackson, Pearl, Madison, Ridgeland, Flowood Mississippi area. Product availability may vary. Contact us for the most current availability on this product. Browse other items in the Accent Furniture - Occasional Tables collection from Miskelly Furniture in the Jackson, Pearl, Madison, Ridgeland, Flowood Mississippi area. Miskelly Furniture is the premier furniture retailer in Mississippi and we proudly serve the metro Jackson area including Pearl, Brandon, Flowood and also outlying areas of Meridian, Ridgeland, Madison, Canton, Tupelo, Clinton, Vicksburg, Florence, Brookhaven, Hattiesburg, and Gulfport, MS. Miskelly Furniture, Jackson, MS, features a great selection of living room, dining room, bedroom, entertainment, and home office furniture, and mattresses. We have accent pieces for your entire home and can help you design and decorate the home of your dreams.